In the middle of seventeenth century, Lima, which today has more than eight million citizens, had only 35,000 residents. 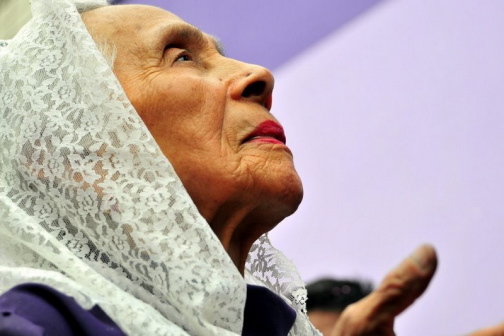 This number increased steadily from that point onwards with the arrival of thousands of people driven by the desire for a better standard of living in the Peruvian capital. Most of these immigrants were from the Atlantic coast of western Africa, which in these days contained Portuguese colonies. These groups consisted of tribes such as Congos, Mantengas, Bozales, Cambundas, Misangas, Mozambiques, Terranovas, Carabelíes, Lúcumos, Minas and Angolas. The Angolas were members of brotherhoods who venerated different images, carrying out related religious acts in which they remembered their freedom and nostalgically sang the songs of their ancestors in their own languages; they also tended the sick, and gave their members a decent burial through the payment of small subscriptions by the brothers. In 1650 the various groups of Angolas united and created a joint brotherhood in the Pachacamilla district, where indigenous people from Pachacamac had previously lived, and where stands the church and monastery of Nazarenas and the building of the brotherhood of the Señor de los Milagros (Lord of Miracles). Their life conditions were those of absolutely poverty. In the brotherhood’s house there were large mud walls; on one of these, situated in a room where the brothers used to gather daily, one of the Angolas created an image, done in tempera, of Christ on the cross. On the afternoon of 13 of November 1655, at 2:45 in the afternoon, a terrible earthquake changed the face of Lima and Callao, destroying churches and homes, and leaving thousand of dead and homeless. The earthquake strongly affected the Pachacamilla district, and all the Angolas’ houses collapsed, including that of the brotherhood; but miraculously, the wall containing the image of Christ on the cross escaped unharmed. As a result of the earthquake, the Angolas move to another area, leaving the wall with the sacred image in a state of dereliction. Fifteen years later, Antonio León, an inhabitant of the San Sebastian parish, saw the image of the Christ on the cross painted on this wall. Even though the wall was very damp and the building that had housed it was in ruins, the Christ image was still in the same perfect condition as the first day it was painted. Truly astonished at what he saw, Leon tidied up the place and built an altar, until he was obliged to stop work due to a strange pain that affected him. By a miracle, the pain disappeared after some days and he returned to the religious image in order to honour it with harps, cajones and musicians. According to the reports of the period, Leon was the first to take care of the place, little knowing that from that point onward intense devotion to the sacred image of the Pachacamilla Christ would start. Leon was therefore the member of the Lord of Miracles cult as we know it today. Among the believers who made up this growing cult, coloured people were predominant. They gathered each Friday night to sing prayers to the Christ, helped by the sound of the harps, cajones and vihuelas, a sort of little guitar. Because so many people attended these gatherings, more for the novelty than out of devotion, often official Catholic religious practices were not followed. So civil and ecclesiastic authorities forbade the gatherings and ordered that the image of the Christ and of the other saints present on the wall should be erased. This order was to be carried out in the period 6-13 September of 1671 by a group of people among whom were a representative of the local archbishop, a notary, an Indian painter and the captain of the Viceroy army, Don Pedro Balcázar, escorted by two groups of soldiers in case of trouble from the curious people who crowded the place. The legend says that, when the painter climbed up a ladder placed against the wall, he immediately started to experience tremors and shakes in his entire body, and was obliged to climb down, helped by his companions. After a while, he tried again to climb up and erase the image, but became so fearful that he could not start the job, so he rapidly climbed down and disappeared. Another man, a soldier of Balcázar, climbed up a ladder, but immediately climbed down, saying that he saw the image become more and more beautiful, while the crown turned green. For that reason, he did not obey the order to erase the image. Because of these strange events, people started protesting loudly and threatening the group sent to erase the image, obliging them to run away. Once the Viceroy knew what had happened and had reflected carefully on the incident, he decided to cancel the order to erase the image and granted people the right to venerate it instead. On 14 September 1671 the first mass was celebrated in front of the crucified Christ of Pachacamilla, and from that day onward the number of devotees grew steadily. Soon the image started to be called the ‘The Lord of Miracles or of Wonders’. During October 1687 a seaquake razed the city of Callao and part of the city of Lima and destroyed the chapel built in honour of the Christ image. But by a miracle, the wall containing the image of Christ remained undamaged. After this terrible event, a three-dimensional image of the painting was made in the form of a statue and was carried shoulder high through the streets of Pachacamilla district, an act that was performed each year. The Lord of Miracles is one of the most important religious phenomena of popular Catholicism. However, although the first mass was celebrated in 1671, organized by the new brotherhood of the Lord of Miracles of the Nazarenas, it was only in 1940 that religious historians started to be interested in it, due to the number of devotes and the interest it had generated. Each year the procession of the Lord of Miracles is bigger and more beautiful. The old litter has been replaced by a sterling silver one, which is cared for by particular staff in a dedicated room in the monastery that now stands on the site of the original painting. 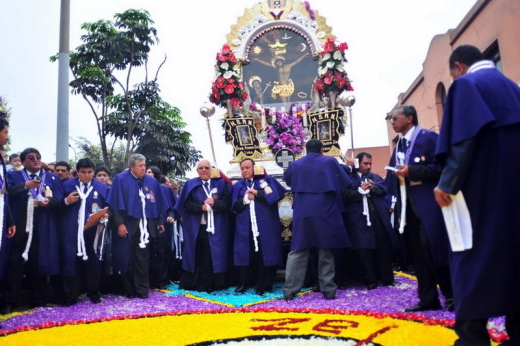 During the procession, male devotees organized into squads of 36 bearers carry the icon through the streets of Central Lima. 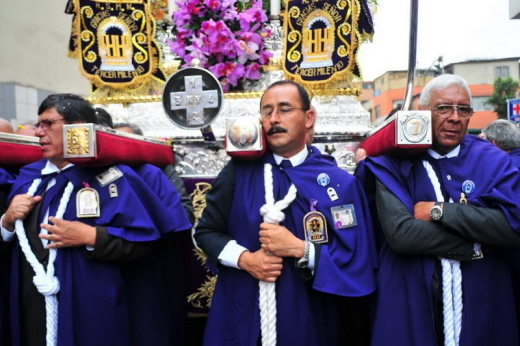 They are the cargadores, or ‘carriers’, a brotherhood charged with transporting the heavy statue. The spiritual significance of carrying the image is so great that to enter the fellowship one must have a patron and pass through a long period of trial and spiritual apprenticeship. The procession attracts hundreds of thousands of devotees and celebrants, who crowd through the streets of the city, singing and dancing, while vendors sell spiritual trinkets and medallions, together with a wide variety of typical dishes and sweets, including Turrón de Doña Pepa, a delicious soft and sweet paste made with eggs, butter, flour, anis and fruit syrup. 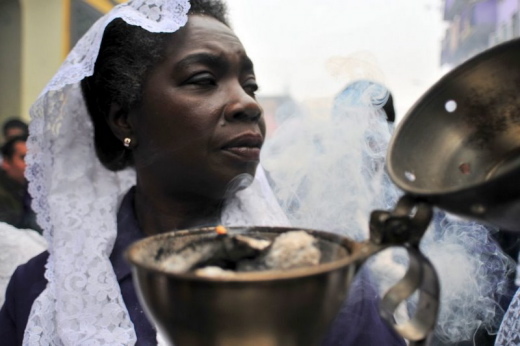 The sterling silver litter that bears the statue is borne on the shoulders of believers who set out on the traditional 24-hour procession from the church of Las Nazarenas, crossing downtown Lima until it reaches the church of La Merced in Barrios Altos. Each of the 4,300 carriers bears on his shoulder a weight of 50 kg, and must walk for a period of 15 minutes to cover a distance of 80 metres. 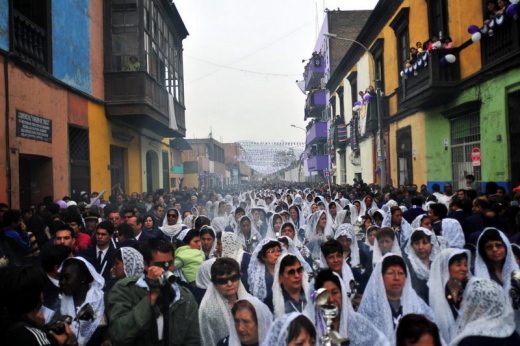 In front of the image march the sahumadoras, a group of 244 Catholic sisters clad in the purple robes that mark devotion to the Lord of Miracles and waving incense burners. Immediately behind them walk the ‘cantadoras’, the 320 women singers who intone the hymns and devotional songs that accompany the procession. Many other minor figures, including penitents, musicians, vendors and peddlers, have become fixtures of the procession. Anyone interested should look out for the civilians in purple clothes, many of whom wear them as a sign of gratitude for a received miracle; some wear these clothes for up to a year. Believers or not, no one forgets to join the procession in purple clothes. 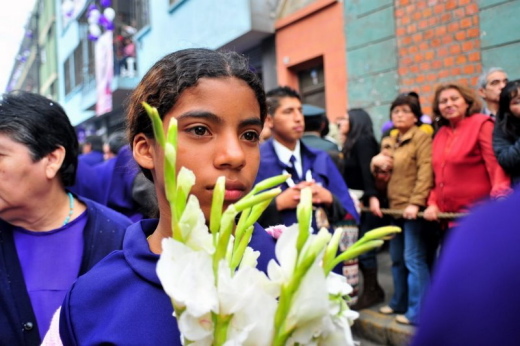 In June people start to buy or prepare the purple clothes, and normally between 700 and 950 outfits for men, women and children are sold by the little shops around the Nazarenas Church. These shops also sell religious articles such as candles of different sizes, religious images of Christ and the saints, incense, etc.